2 Bedroom Semi Detached Bungalow For Sale in Bournemouth for Asking Price £265,000. 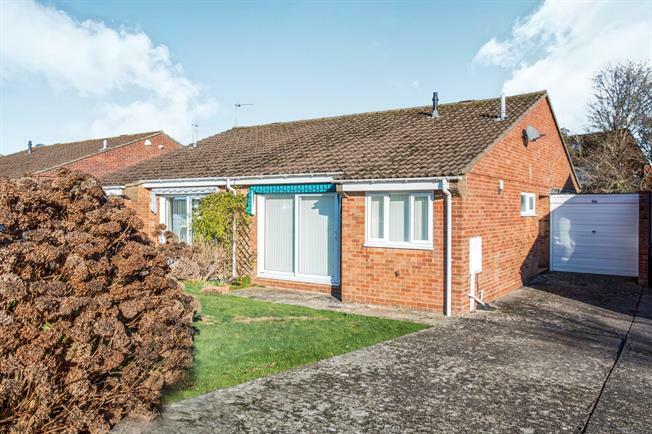 VACANT POSSESSION - Palmer Snell are pleased to offer this deceptively spacious 2 double bedroom semi detached bungalow with a garage and ample off road parking situated in a desirable road Cox Avenue in Muscliff close to bus routes, local shops, doctors and river walks. The accommodation comprises an entrance hall, 18'5" lounge/diner, 11'1" modern kitchen, 2 double bedrooms, shower room, UPVC double glazing, gas central heating, parking in the front for 4+ cars, garage with electric door and a private rear garden. Via UPVC double glazed door and side window. Radiator. Airing cupboard. Fuse box. Doors to accommodation. UPVC double glazed patio doors to front aspect. 2 radiators. Storage cupboard. TV point. Space for table and chairs. Door to kitchen. UPVC double glazed window to front aspect. Range of wall and base units. Sink. Radiator. Space for washing machine and fridge/freezer. Integrated dishwasher, oven, hob and hood. Tiled walls. UPVC double glazed window to rear aspect. Radiator. Built in wardrobe and dresser. UPVC double glazed patio doors to rear garden. Radiator. Frosted UPVC double glazed window to side aspect. WC. Wash basin. Shower in cubicle. Heated towel rail. Tiled walls. Electric up and over door. Power and lighting. Door to rear garden. The front of the property is laid to lawn with driveway to the side allowing off road parking for 4+ cars leading to the garage. The rear garden has a patio off the property with the remainder laid to lawn. Shed space.